The people who get on in this world are the people who get up and look for the circumstances they want, and if they cannot find them, make them. Home Motivational Quotes The people who get on in this world are the people who get up and look for the circumstances they want, and if they cannot find them, make them. Do you want to be one of the people that get on in this world? If you want to be something called great, go out and look for that thing. Find someone that is what you want to be and ask them to teach you. Go out and find the circumstances you want. 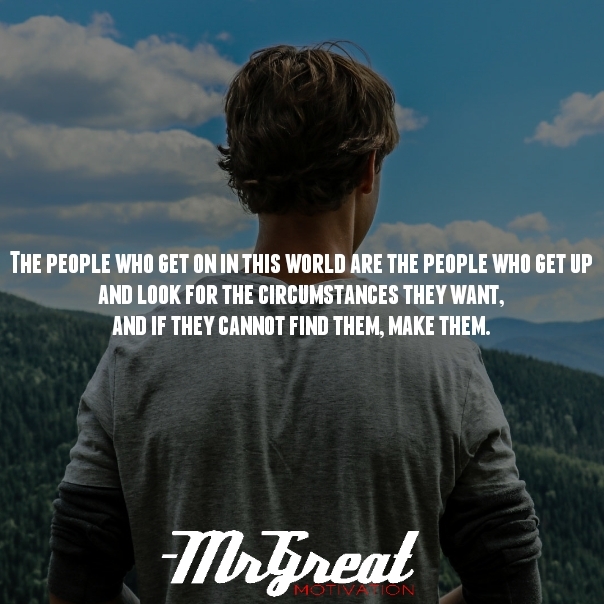 If you can’t find the circumstances you want – Make Them. That is powerful. We have the power to create what doesn’t exist. Isn't so great? The Wright brothers aspired to fly. They guessed that man could fly. There was no circumstance out there at that time. And they didn’t have the technology we have today. But they did it with great hard work and passion they created the circumstances to fly in the sky. People who want to get on in this world today create their own circumstances frequently. You can write down and plan accordingly. This will help you set the what, the why and the how. If you believe in your circumstances, you fall victim to settling for the way things are, not for the way things could be. If you settle for the way things are and they are bad, you sink into a pit of discouragement and hopelessness. If you settle for the way things are and they are good, you grow complacent and proud. Believing in your circumstances puts a ceiling on your own growth and limits what’s possible. Create circumstances on your own with positivity and motivation you have within.